“My long-distance saddle problems were solved by a RIDO saddle – at first glance an unfriendly-looking totally rigid saddle. “You kindly helped me obtain one of these saddles back in May and I wanted to thank you for your help. I have suffered from what has been described as chronic pelvic pain (prostate problems) for several years, however I have now been using your new saddle regularly now for two months and so far I have had no pain or discomfort at all. I find it hard to believe that all my pain and discomfort could have been triggered by something as simple as having the wrong saddle on my bike, but so far it seems to have been the reason for my past problems. 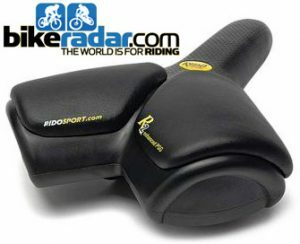 “One of the things I’ve liked best about my Rido saddle is that it just works, there’s no gel gimmick, cavity area, etc. The seat seems to have a perfect blend of flexibility and stiffness and allows me to ride much longer than before. “I would just like to say how impressed I am with both the saddle I ordered on Monday and your service in having it delivered to me within 24 hours! It took me some time to adjust the saddle to suit me exactly and it seemed strange at first, compared to my previous gel ‘comfort’ saddle. However, after only 5 minutes riding I noticed a huge improvement in comfort and finished my ride with no ill effects at all. So far, so good – I will now look forward again to some longer rides which have simply not been feasible since I suffered some bladder and prostate problems last September. “If it wasn’t for this saddle and it’s predecessor I would never have been able to graduate from 30-40 mile rides to 80 – 100. I was suffering terribly from numb nuts syndrome (NNS). I had tried a number of saddles at around the £25 – £40 mark but none resolved the problem, one even left me with NNS for two days after the ride. This was very worrying! Although there are a number of saddles that have had great reviews and sound as though they would do the job they are also quite expensive. I simply couldn’t afford to experiment anymore. “Simply outstanding! I have tried numerous saddles over the years. A lot of money, a lot of different materials (yes Brooks included) and none has come close to this. Grooves carved on previous saddles show that the bones on either side of my perineum carve into a saddle’s arch. Those with a hollowed-out centre have merely led to my bones rubbing on each side of the cut out. Ouch. I have never been able to ride comfortably for two days in a row before now. Long rides always resulted in sore and embarrassing problems. Now I don’t think about it. Also, from using tubs of ‘chamois’ cream I now use none. Yes, none. Something the review fails to mention is the dissipation of impact on the sit bones due to the design. Several other saddles where you are perched solely on the sit bones have less shock absorbent properties. This leads to swelling. “It took a while to get the position right. It’s obviously extremely subjective but I found raising the tip a fair amount worked best. And yes it may be weighty (that’s a whole 40 grams heavier than my Brooks Swift – I put them on the scales) but I’m putting out a lot more power because I’m no longer hurting. Especially from one hour onwards. So, yep, I’m going a lot quicker. For me it’s the best improvement you can make to a bike… any bike – the Rido presently adorns my carbon racer… and it’s only thirty quid. Read all the grateful reviews on the Rido website if you think I’m either connected to the company or a lone madman crying in the wilderness. “Saddle design has been stuck in the dark ages – they looked at what people put on a horse and tried to do the same for a bike. It was a case of wrong thinking. Fortunately Rido has done something about it. << Back to index “I have to convert some unbelievers. I will say, however, that I did not try the original (although it was only the price of two inner tubes). My experience is based on the R2. What I can say though is that buying this was the last desperate throw of a dice in a game in which I’d run up a string of heavy losses. The list of wagers that didn’t come good included (draws breath, the list is long) – from the Selle Italia stable – SLR XP, Max Flite Transam, Flite Gel, Turbo, Turbomatic gel; Brooks – Swift and Professional; San Marco – Rolls and Rever. Some offered me longer periods of comfort than others but all would eventually turn nasty and revert to torturing me. It was exasperating. I have a great carbon frame (Argon 18), great wheels (record hubs, excellight rims) a great groupset (Chorus) but how the hell do I sit on all this without inflicting unspeakable damage on my undercarriage? “I was intrigued by the Rido but sceptical because I’d been so scarred (literally) by previous experience. Decided not to hold back with the testing. First ride – two and a half hours in tatty, worn racing shorts and no cream. Too much pressure pushing me forward BUT I was going faster towards the end. Result no sores. This was unprecedented. Some subsequent tinkering and I found the sweet spot – tip raised by a lot, perhaps 15 degrees. I do tend to grind a bit with my 80kgs but I was putting out more power for longer, especially on the flats, because my legs were unhindered by jabs of pain. I was even complimented on improving the fluency of my pedaling by a former international racer. “Never had the erectile problem but I have suffered numb nuts and following a lot of pain and a raised PSA, which is a sign of testicular cancer, I bought a Rido saddle see: www.rido-cyclesaddles.com/. These are superb and from day one reduced any discomfort or pain. Fortunately no cancer and many happy hours comfortable cycling later I will not sit on anything else, at least on my bike. “I spotted the Rido while trawling through pages of saddles on the SJS Website and it immediately made sense. The price is excellent – it encourages you to take the chance as it is affordable. Also, the write ups and reviews were great. I have not had a minute’s discomfort on the saddle and I’ve been riding up to 270km per week. I have ordered a second for an upcoming cycle tour to New Zealand in November and can’t wait to tour on it. 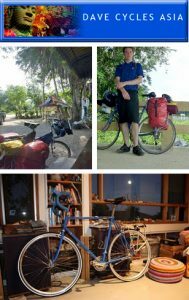 “I ordered a second Rido saddle for cycle touring and wanted to make it a priority to send you some feedback. We spent 3 weeks cycling in New Zealand, much of that time on gravel surfaces of varying quality. In total we cycled aproximately 900km and I did not have one moment of discomfort on my new Rido saddle. The length of our days varied from 50-100km, with bikes fully loaded. At the very least one would usually get some sort of pressure pain, however I did not experience anything of the sort which I had come to expect on other saddles I’ve toured on. “I bought the saddle to overcome soreness down below which at first did not seem to be any better when I first used the (R2) saddle. It was only a short ride of about 7 miles. As I used it on longer distances it seemed to get better. The ultimate aim of my cycle training was to ride with a group of friends from Lancaster to Bridlington across the Pennines in 3 days on our racing bikes.This was a distance each day of 65, 70 and 85 miles respectively. The Rido R2 saddle didn’t give any soreness at all on the 3 days. So I am really pleased with it. The only minor gripe I have with it is it looks rather strange compared to other saddles.